Picking up a used luxury car is a good idea in today’s market where Used Exotics are Going for Honda Accord Money. 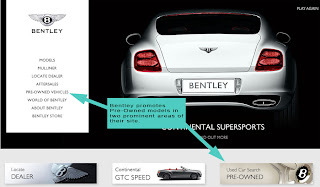 So who is pushing certified pre-owned (CPO) in their marketing? BMW, who is mentioned in the article, is running a promotion for 0.9% financing. Lexus is doing a 2.9% promotion n the RX model. Other brands are also providing financing incentives across their CPO fleet. Bentley actually makes the most prominent promotion of their used-vehicle offerings. There are two prominent access points to used car listings. Bentley suffered a new vehicle sales drop of 20% for all of 2008, so moving product, even used is imperative to keep sales going in this economy.